Chainfire, well-known developer of applications to root Android devices, has already tried in its meats the new budding version of the operating system of Google. That's right: Android O's first Developer Preview (out of a total of four), fresh from the oven (less than a day ago), has been rooted. But of course, on the one hand we find the simplicity and speed of the method, and on the other the problems derived from the rooting in a rather unstable version. The announcement is official since it comes from Twitter's official account of Chainfire, the famous developer who created the SuperSU tool, a real milestone for anyone who wants to gain root access on their Android device. 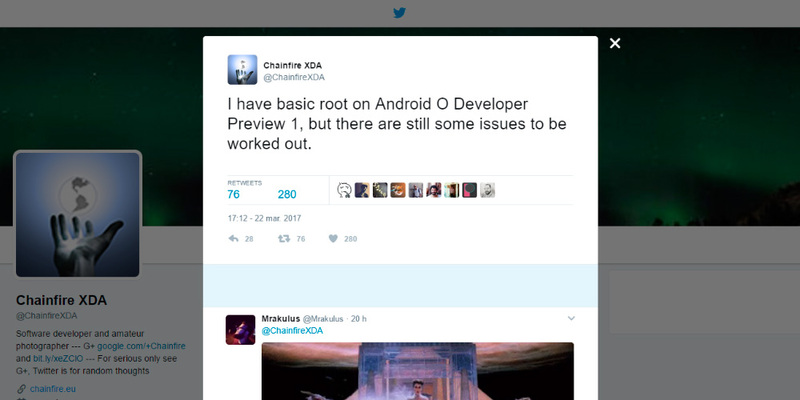 As indicated in the tweet, Chainfire has already discovered all the necessary bases to obtain root permissions in Android O Developer Preview 1, although there are still some problems to solve. Undoubtedly, the best news is the speed with which the developer has already obtained the first results, although we must wait a little longer before having a public tool to root our smartphones on our own. However, all owners of Nexus and Pixel who have a special interest in modding, can rest easy, knowing that Chainfire continues his work, even with the recent Android O. The development of the new version of SuperSU (we assume) could take a few more days. But it will all depend of course on the amount of changes made by Google in the new version over previous versions. However, we are sure that most users can afford to wait, since few have installed the first draft version for developers of Android O, and those who have, certainly not with the intention of rooting it.